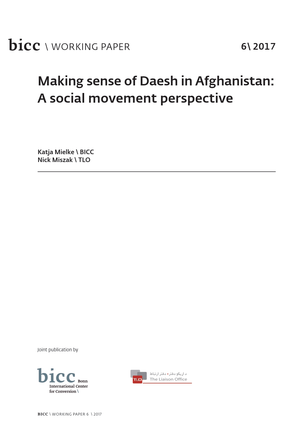 BICC Working Paper 6\2017 “Making sense of Daesh in Afghanistan: A social movement perspective” builds on a ten-month fieldwork-based research project conducted in four regions—east, west, northeast and north Afghanistan—during 2016. The authors Katja Mielke and Nick Miszak analyze so-called Islamic State (IS or Daesh) in Afghanistan as a context-specific phenomenon that manifests differently in the various regions across the country and is embedded in a long-term transformation of the religious, cultural and political landscape in the cross-border region of Afghanistan–Pakistan. The direct links between Daesh in Syria and Iraq and its branch in Afghanistan are relatively weak, mostly indirect and largely symbolic, performed through public displays of allegiance. The Working Paper demonstrates the usefulness of a social movement analytical approach and concepts, including opportunity structures, coalition-building, resource mobilization and framing, to the study of Daesh. It disentangles the different types of resource mobilization and long-term conflicts and shows how they merge in the manifold representations of the phenomenon of Daesh in Afghanistan. In dialogue with other approaches to terrorism studies as well as peace, civil war and security studies, Katja Mielke’s and Nick Miszak’s analysis focuses on relations and interactions among various actors in the Afghan–Pakistan region and their translocal networks. It suggests that, while Daesh in Afghanistan is not the extended arm of Raqqa, it certainly has to be taken seriously. For it is precisely this relative autonomy that makes it likely to survive the fall of Mosul and Raqqa.